330 W high power output. CONDITION: NEW. Suppressor enables clear bass reproduction. The Sony® GS-100 Class-D subwoofer amplifier affords incredible installation flexibility thanks to its compact size and packs quite a punch. GS series amplifiers offer tremendous value including convenience features such as: modern cosmetics, variable cross-overs and singe-side electrical connections to suit almost any application. You'll get up to 600 watts RMS of bass power with Sony's XM-GS100 mono amplifier driving your sub. For maximum reliability, this compact amp sports a hefty heatsink that shunts off the heat that's generated when the amp's working hard. • Max power output: 1100W max power. The XM-GS100 has a removable top panel that conceals a variable 12 dB/oct LPF (Low-Pass filter) at 50-300Hz as well as a 12 dB/octave sub-sonic HPF (High-Pass filter), variable at 6-70Hz to maximize your systems potential. 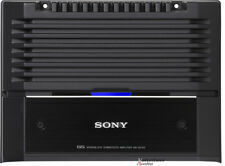 Sony Xplod Mono Block Car Subwoofer Amplifier. - Refer to photos -. Tested Fine. (Not available to all Countries). SORRY - No personal cheques. MONEY ORDERS OR BANK issue cashiers Cheques (Australia Only). See photos. This item is untested and sold as is with no returns. I have no idea if it works. I bought at a thrift store. Would be great for your vintage car. I also have listed Sony Cassette player. 330 watts RMS x 1 at 4 ohms (600 watts RMS x 1 at 2 ohms). Class-D amplifier design. variable low-pass filter (50-300 Hz, 12 dB/octave). variable subsonic filter (6-70 Hz, 12 dB/octave). variable bass boost (0-10 dB at 40Hz). Sony XM-GS100 Mono subwoofer amplifier,1100W Max power. This item is pre-owned. It is a Sony XM-GS100 car amp. This item is being sold AS IS/BROKEN. However when a speaker is connected it goes into protection mode and the light indicator turns to red. The Sony plate is not attached or included with this amp.